Security hardware such as window locks keeps unwanted intruders from accessing mission-critical equipment in the office, home, or business. Pro-Lok offers a wide selection of security hardware that is ideal for protecting your investment. Browse our selection of security hardware such as cabinet locks and similar devices in our convenient, secure online shopping platform. 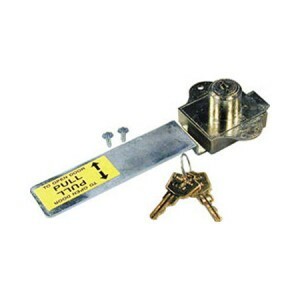 Our Fire Cabinet Lock is a self-contained trip lever cylinder lock assembly which is designed to fit common glass fire cabinet doors such as found in office buildings and industrial facilities. Fire cabinets often contain emergency equipment like fire hoses, extinguishers, and protective blankets. If these cabinets are unlocked, tampering with the contents is a possibility, compromising your employees’ safety if a fire were to occur in your facility. Our security hardware is crafted from durable hardened steel and is plated to prevent corrosion. Fire window locks last for years and come with two keys for your convenience. These locks can be adapted to other uses, such as in file cabinets, storage containers, or anywhere else you wish to avoid unwanted access to your equipment and supplies. Pro-Lok was established in 1983, and in that time we have become an industry leader for professional locksmiths. Our huge selection of locksmithing equipment, parts, and accessories have made us a trusted choice among professionals in our industry. We pride ourselves on our commitment to outstanding customer service, offering a wide selection of tools, parts, and security devices that can be found in the hands of professionals around the country. Take a look at our wide selection of tools and accessories by browsing our easy-to-navigate online website, or contact us today using our online form. At Pro-Lok, we stand ready to help you find the security hardware and tools you need for your specific applications.